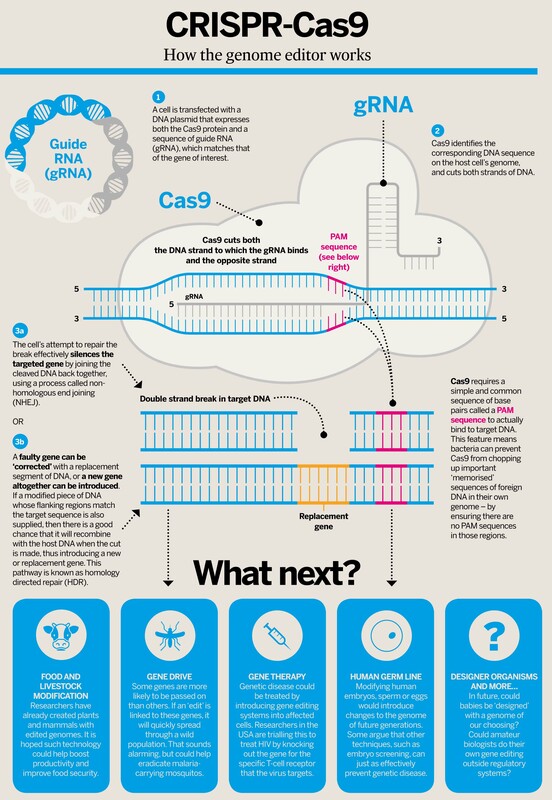 Everybody is talking about CRISPR-Cas9, the revolutionary system that makes it cheaper and easier to 'edit' genomes. But do you know how it works? At the end of 2015, hundreds of scientists gathered in Washington to discuss the potential applications of and global attitudes towards gene editing. The debate centred around the revolutionary CRISPR-Cas9 system, which makes it easy, cheap and quick to alter and move genes around. A few months later, UK regulators received the first application for permission to use the system to genetically modify human embryos. The technology uses the natural efficiency of the Streptococcus pyogenes immune system to cut genomes in precise locations. Developed around three years ago, the method is now the go-to technique for mutating and editing DNA. CRISPR-Cas9 technologies appear to work in pretty much every cell type tested so far, including humans. The technique is more efficient, far easier and much cheaper than older gene editing technologies, such as zinc-finger nucleases and TALENs. The system has already been used to engineer crops and livestock, and trials are under way that would mean it could be used in gene therapy for human disease within a few years. However, the ease with which scientists could make changes to genomes has sparked widespread concern about its potential applications. These escalated when a team in China announced they had 'edited' the genome of human embyros, albeit non-viable ones. In September last year, one of the pioneers of the CRISPR technique, Feng Zhang, announced the discovery of another bacterial protein, Cpf1, which he claims may make it even easier to edit genomes. CRISPR-Cas9 is a system used by bacterial cells to recognise and destroy viral DNA. CRISPR stands for 'clustered regularly interspaced short palindromic repeats' – that is, short repetitions of base-pair sequences that are interspersed by segments of 'spacer DNA', which are sequences from previous exposures to viral DNA. Cas9 is the name given to the protein that cleaves the invading DNA based on the sequences 'memorised' by the CRISPR system. Researchers can use Cas9's function to break up any section of DNA they like simply by creating a sequence of RNA to form a complex with Cas9. The protein then targets the corresponding DNA sequence in any cell it is introduced to.